I’m loving this series we’re in, and today I’m bringing you one of my favorite topics – stress. Stress is a hugely negative emotion and it causes massive disruption in trying to maintain a healthy physical and mental state. What I’ll be covering on this week’s episode is how you can tackle stressful moments so you can avoid overeating and overdrinking. I’m sharing two examples of conversations I’ve had in the past to highlight how stress is actually caused by thoughts you’re having, even though it can feel like it’s being caused by your environment. We seek negative habits in those moments and I’m delving into how you can interrupt those stress patterns. Join me to learn how to unlock and dial down those stressful feelings so you can take really good care of your physical health and eat well. We’ve been taught that stress is normal, or even a sign of success, but I want to show you that you don’t need to accept that belief. Download this episode’s Stress 101 worksheet here! If you’re getting stuck answering your own why questions, this is a perfect opportunity to have a mini session with me! I’ll guide you through and help you gain some insight and steps you can take in your next stressful moment. Why stress is the biggest disruptor to your physical wellness. Why you don’t have to accept or believe that feeling stress is the norm. How to interrupt a stress pattern from developing. One question to ask when you notice wanting to overeat or overdrink. How to start understanding your brain patterns. Welcome. It feels like ages since I’ve spoken to you because I started recording my podcast ahead of time and it’s been a couple weeks since I’ve recorded. Good thing, I had the worst laryngitis cold for a week. So I am just so glad to be back here at my microphone and getting a chance to speak with you today. I hope you’re doing well. I’m absolutely loving this series we’re in, and today I’m bringing you one of my most favorite subjects. Stress. Okay, why is it one of my favorites? Because I know that if you’re able to learn how to react differently in any stressful situation, that it will become much easier for you to take great care of your health. It’s absolutely essential. 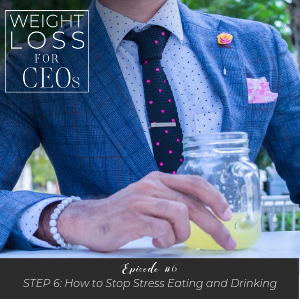 I’ve intentionally added this episode into the weight loss series that I’ve created because stress is the biggest disruptor to your physical wellness. Experiencing stressful emotions in your body creates health issues for all of us. It can produce high blood pressure, high cortisol levels, insomnia, weight gain. But the experience of stress is also disrupting your best intentions of eating well and exercising. So stress not only has a true physical effect, but also a very important mental one. Stressful emotions create a natural reaction of moving towards or seeking comfort and it’s just human, by the way, and when we seek comfort, it causes overeating, overdrinking, and sometimes even over-exercising. This has become a pattern. The stress pattern and how we react to it can become a really bad pattern if we don’t realize what’s happening to us. For many of us, we are unconsciously eating behind our own back as well as using food and alcohol to calm our body down because we’re experiencing so many stressful emotions. And as far as eating well and eating to the hunger scale as I’ve taught you here in step three of my series, it is really difficult to be in control of your eating when you are feeling strong emotion. Our body wants relief, and when we are stressed or agitated, we eat fast and it’s truly a challenge in those moments to be mindful at all. So what I want to unlock for you today is a way to dial down those stressful feelings so you can do what you most want to do in those moments, take really good care of your physical health and eat well. In our culture, we have accepted that stress is normal and, in some ways, aren’t we proud of it? As it’s almost like a – we puff our chest up and I’m so stressed, I have so much to do, you know, that it shows that we have busy and full and successful lives. As if stress is something that we need to prove others that we have. But I hear it all the time, “I’m so stressed out.” But I want to help simplify the concept here by showing you that you don’t need to accept or believe that stress is what you should be experiencing most of the time as a business owner or entrepreneur. Let me repeat that. You do not need to accept this belief in our culture that experiencing stress is kind of status quo or the norm. And especially as a fellow business owner or CEO, entrepreneur, whatever you describe that solo work, you know, it is common to experience a lot of stress, but I do believe there is a different way. This is so important to me as I’m working with clients because stress comes at a very high cost. It creates a loss of concentration, it creates brain fog from using alcohol every evening to wind down. I feel like that’s why we drink so much coffee in the morning. It can create a vicious cycle. And as well, it takes a natural toll on our overall physical health when we gain weight and the issues that that causes over time. So let me explain the pattern I’m describing. Stress as an emotion or a set of emotions that really come from our thinking. The circumstances in our lives trigger stress, but to explain this more clearly, the circumstances in our lives – deadlines, children being sick, full travel schedule, low sales reports, bad stock reports in the market – any of that can trigger thoughts in those moments that cause stressful and strong emotions. Do you see how sneaky one thought, “I might miss my deadline,” – again, it was a might – created all these ugly, ugly thoughts and fears? It’s like opening a can of worms. And this is why we avoid looking at these moments on our own and why it’s hard sometimes to understand our thoughts in these moments. It still feels like the circumstance of the deadline is creating all those emotions, but there always are thoughts in between. We feel so overwhelmed we just want to move away from it, but what I want to offer you here is an opportunity not only to interrupt these patterns but to turn them around and really by just investigating and seeing what thoughts are going on for us. Remember, our brain works so quickly that we think that we’re experiencing stress directly from the circumstance of the deadline approaching. But there’s a missing step. All those thoughts, remember my list, and there’s many about that deadline. We have spent our lives reacting but we have not been taught that we can manage our thinking on that key thought step that goes in between. Again, the circumstance and our response to it. Let me illustrate with another example and give you an opportunity to learn more about those moments for you, and sometimes that’s just enough to bust those stressful moments, and how you can turn them around. My most favorite example of teaching this was in a wellness workshop. I asked the group what stressed them out the most. Now, this was a group of salespeople, they’re high-strung, they’re amazing individuals, and one of the participants shared very freely that her commute stressed her out. And she just said, “My commute stresses me out.” And I asked her why, and she shared because it always made her late and ruined her day. She believed that her commute ruined her day. But to understand the thoughts and the stress reaction, I’m going to use the thought model in this example for you. And the thought model again is this, circumstances are the facts of a situation. Thoughts are the reaction to those circumstances. Thoughts create our feelings, which is an emotional response, good, bad, or neutral to every thought we think, and our feelings create actions or inactions. For example, most stress or very high negative emotions shut us down. And joyful or inspired emotions create action. Then, our results come from the actions that we take as a result of that thought and those feelings. Our results come from every thought we think. So back to this example I’m going to illustrate. The circumstance here is a 45-minute commute. Everyone in the room could agree. It’s a fact. She had a 45-minute commute. But when she thought, “My commute makes me late and ruins my day,” that was her thought that was creating all that stress. She was feeling stress, anxiety, and anger. And how did she react when she felt stress, anxiety, and anger? And for people that are working around their food responses and how they take care of their bodies, I asked her how did she treat food when she felt those emotions? Oh, her actions were so clearly coming out of stress, anxiety, and anger. She rushed into the office, described grabbing a coffee roll for breakfast, barking at her teammates as she rushed to her telephone to call a client, and was just in a general agitated state during most of her conversations as well as during most of the day. Not a great day, right? Her commute was ruining her day because she thought her commute was making her late and ruining her day. That thought was running over and over in her mind on auto repeat in a way that she wasn’t even aware of it until I just asked her a few questions. Her thought about her commute was creating the result of a pretty bad day, as she defined it. Overeating when she didn’t want to, barking at teammates, and really having some agitated conversations. Kind of rushing through her calls with clients. And you know how I know it was all in her thinking and it wasn’t a truth or a circumstance? I asked her one more question. I’ll never forget this question. “How many days were you late for work last year?” And she paused. Three. She said, “I was only late three days last year.” Three days that her commute made her late and maybe ruined her day on those days. But on the rest of the days, during the rest of the entire work year, her thought that her commute was making her late and ruining her day, creating all those stressful, angry, frustrated emotions, all of those days of misery and anxiety were because she was thinking her commute was going to ruin her day because she was always late. It’s just amazing what her brain does here. How do we turn this around? How do we interrupt these stressful moments that create so much overeating, overdrinking, and just feeling miserable? How do you know when it’s happening? How do we take responsibility for what we’re thinking here? I have a simple process, and I want to remind you, I have a great worksheet for you that you can fill in your own thought model in the show notes. Dianamurphycoaching.com/42. But I’m going to show you how here. Just take a listen. When you’re feeling a lot of stress or that intensity, or you’re noticing even you reaching for – like, not being able to wait until wine o clock at night to be able to calm down, or you are grabbing food fast, you’re eating quickly, just stop in those moments and ask why you are feeling stressed. Take some time to even write some thoughts down and ask yourself why as many times as it takes to feel like you know what’s going on in your brain. Be as annoying as a two-year-old asking why, why, and you will see the cluster of thoughts that have been triggered by that stressful moment. And he literally watched himself with this thought, “Because if I stop paying the mortgage, my wife and kids will leave me.” Literally, if we ask our brains why, we’ll answer, and those thoughts will come out that are running in the background. We all started giggling here because the account executive that I was speaking with knew that his wife would not leave him if he didn’t hit his numbers, but his brain or his thoughts did believe it. Isn’t this crazy? Our brain can go to the darkest places, but we have an opportunity to stop this pattern every single time. Remember, when you’re trying to dial down stress with your whys and getting to the bottom of it, remember, your brain is a negative thought machine. It leans to negative. Our brains were created to help us to avoid things that would kill us. It’s that part of our brain that was designed when we were surviving like cavemen. So it is a natural negative thought machine. So don’t worry and don’t judge the thoughts that come out when you ask your whys. They are just thoughts. And also remember, our brain loves pattern. Until we stop and question it, we don’t understand what’s going on. It’s running on auto repeat. It’s subconscious thinking. By asking these why questions, by coaching, by kind of getting curious with yourself here, you will reveal the pattern. And emotions love company. Remember how I described this as stress? But when I ask clients more often, “What are you feeling when you think that thought?” they will have a plethora; there’ll be five or six things that they describe. Stress can be an overall, like a bucket of emotions, and most of them are really negative. Frustrated, angry, sad, almost scared. So remember that emotions love company. So the minute that we trigger one stressful – like, oh my gosh, I might be late with this deadline. All the other negative emotions like to join in. Isn’t that lovely? But that’s why you’re feeling overwhelmed, and that’s why it’s so important to know that you can manage it by interrupting, wait, why am I feeling this way right now? And to manage your thinking in those moments. Now, digging in and understanding our thinking in these moments can be all we need to do because I think it’s fascinating. Do you remember our giggling moment when we realized that the account executive’s brain, really, it was just his brain thinking that if he didn’t hit his numbers, it was going to that end result that his wife would leave him, right? And it’s only one month, and the thought was really, “I might miss my numbers,” not even that he was missing his numbers. So we really need sometimes just to look at the thinking and we can almost giggle at what our brain is offering. And this is where getting really curious can be a lot of fun. So again, digging in and understanding what the thoughts are can really diffuse the entire stressful moment. But remember the commuting example? After asking her all the whys and showing her her thinking, I asked another simple question. What is another way you can think about this time that you’re spending in the car? You know, always ask like when you’re thinking about sales results at the end of the month, what is another way you can think about this? Can you even think, “I can’t wait to see if I hit my numbers?” Can you just tweak your brain just to a little more positive question? It can be literally life changing to start offering and asking better questions in this moment. Okay, I’m getting a little off track here because I get so excited about not only revealing what’s going on in our brains because it can be so helpful, but also in helping you to understand that you can turn this around. And you know what? I bet that activity was not ruining her day because literally, she started thinking, “This can be the best time of my day.” Getting some quiet time alone, which created calm, great ideas about ways to spend that time, and I bet you a dollar she wasn’t eating a sweet roll as she walked into the office and she wasn’t barking at her teammates. She can create an entirely different result just like you can by changing the way you’re thinking about different moments in your life. And remember, they’re just on auto repeat. Your brain is a negative thought machine. It loves pattern. Those negative emotions love company, but you can always interrupt it and manage it. In closing, managing our busy, beautiful, fast, and amazing brain is literally the key to the universe. And for today’s episode, the way for you to experience much less emotional stress so that you can stop running to wine o clock or a beer every day after work or to stop seeking chips in the pantry when you think of your to-do list at night, and even those moments when you have not taken any time to process your day after work and so you’re racing through dinner with your family, you’re not really enjoying the time with them because you’re still in that, “Oh my god, I had the most horrible day,” kind of space. This is where stopping and asking why are you feeling this way can really interrupt it and help you be really present in those moments at home as well. This is a powerful way to decrease the natural need to reach for food and alcohol to feel better. This is why this episode is so important to me and such an important part of the work I do with my clients. It is the way to feel better ahead of time so that you can begin eating more and more often for truly just your physical hunger. I want to make a special invitation here. If you are getting stuck answering your own why questions in this exercise, this is a perfect opportunity to have a mini session with me. A mini session is just a short coaching session where I walk you through the one thing – in this case, that’s stressing you out – and give you a heads up in looking at your thinking. I’ll guide you through those simple questions and help you to come out of this session with not only that insight but your own personal steps that you can take in your next stressful moment. How valuable could it be for you to interrupt your most common stress triggers, dial down those overwhelming and stressful moments? Check out my show notes, dianamurphycoaching.com/42 for your stress 101 worksheet or that magic link to a mini coaching session. I’d love to meet you and I’d love to help you in your stress cycles. Alright, until next week. Thanks so much for being here and thanks so much for listening to this podcast.